I have had this turntable for 20 years and have not felt the itch to upgrade. It is on its second motor and is probably good for another 15 to 20. The self-lubricating bearing makes it lower maintenance than other turntables. It does not win high marks for appearance but it more than makes up for that in sound and performance. It has a richer tone than other turntables at or near its price. I find the Grado Reference Platinum is an excellent match for this table without getting too pricey. The folks at SOTA, a true mom and pop outfit, are a joy to deal with. In a perfect world, the only thing I would change on this table is the arm but there was probably nothing better at this price range back in the mid-1990s when it was made. The newer Moonbeams use Rega arms, which may be a little bit better. Nonetheless, this is an amazing turntable that has stood the test of time. Call it a minimalist TT nad yes, it is. Well thought of. No fancy shapes...what's that for anyway? Marketing? Simple design makes it so user friendly. I'd say it sounds better than my Empire 598 and my stock AR XA. Armed with a Grado M1+, sound is very transparent, warm and three dimensional. What more can I say, for the price, you can't beat it. You you come across one, buy it, you'll not be disappointed. Great sound for the price. clear, clean and slightly warm. Replaces a B&O with broken stylus, this is a great table. It is not the most beautiful table looks industrial, but sounds great, come complete with VLMT tonearm and dust cover. Brings new life to the old vinyl, and for someone on a budget you can't go wrong. 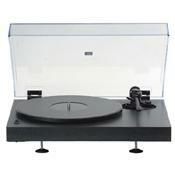 this is not the $100 toys at the bigbox but an honest to goodness turntable. it is very musical easy to use and live with. Bought it online for todd teh vinyl junkie, came bundled with the Grado gold, a great cartridge and match for the turntable.